"Try to be the god on earth, the all-powerful and all-mighty your dog thinks you are. Never let him learn his mistake." Will Judy, 1949 Early in his life, William Lewis Judy was groomed to be the minister of his small rural Pennsylvania community. But fate had other plans for him. He traveled the world, served in World War I, and became a lawyer, all before finding his true calling as a prolific writer, editor and publisher. In 1923, Judy purchased Dog World Magazine, and served as its publisher through the 1950s. He also wrote books about dogs, human nature, and anything that fascinated him. No matter what the topic, He always appealed to the better nature of mankind. Judy was knowledgeable about all aspects of man's best friend; from their anatomy, to the building of their kennels. His greatest legacy, though, may be how he educated a growing nation of dog-enthusiasts about the unique spiritual and emotion bond between dog and human. In 1928, Judy established National Dog Week, a time when dog lovers across America made a concerted effort to honor canines for all their contributions to society. 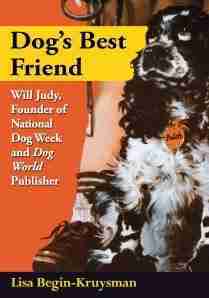 Judy truly understood the power of words, and his remarkable skills as a writer and publisher inspired me to develop my own talents as an author and a communicator to help "write" the wrongs for our companion animals and to subsequently write the first book ever to chronicle his life's work: Dog's Best Friend: Will Judy, Founder of National Dog Week and Dog World Publisher, excerpted below. Will Judy referred to National Dog Week as a "movement." A movement is defined as a series of organized activities working toward an objective. With the use of that word it is clear that its founder intended for this tribute to the dogs of America to be observed enduringly and enthusiastically throughout the United States during the last full week of each September. In the pages of Don't Call a Man a Dog, Judy stated, "We do not plead for more dogs, but for better dog owners and better care for the dogs we already have." That mission statement would serve as the foundation of all the National Dog Weeks to come. To those who might have dismissed the need for a full seven days devoted to dogs, Judy reminded them in minister-like fashion that, "No one ever sinned greatly by being too kind, too helpful, too humane." With his National Dog Week initiative, Judy reached out to engage the members of what he called "the cult of dog ownership...founded upon a warm heart..." and for those who still thought he had gone too far added, "An error of the heart is never altogether that." Educating the public about National Dog Week at the time of its initial observance was challenging. Imploring the nation to spend time and money on the care and maintenance of dogs during uncertain economic conditions proved daunting even for such a master of marketing as Will Judy. Six months before the advent of National Dog Week, the Chicago Daily Tribune published an item that showcased Will Judy's concern for the dogs of his city. The brief item titled, "Dog is Man's Friend, Give Him a Pound," described a speech that Judy had delivered to the Committee on Animal Protection of the Women's City Club. In it, Judy urged that, "every Chicagoan should back the committee," that had been trying get a modern facility built to shelter the city's stray animals. During its official launch in September 1928, Clara Bow graced the cover of Film Weekly, Louise Brooks starred in the film, Beggars Life, and a Wire-haired Fox terrier named Talavera Margaret was named Top Dog at the Westminster Dog show in New York City. In the nation's Capitol, President Calvin Coolidge was serving the last of his term and although there is no record of it, Coolidge was likely to have been a great fan of National Dog Week. President Coolidge and his wife, first lady, Grace Coolidge, were noted animal lovers, especially when it came to dogs. Coolidge once remarked, "Any man who does not like dogs and want them about does not deserve to be in the White House." It has been suggested that in his childhood, the shy Coolidge found comfort and companionship in the quiet presence of animals, something that appears to have stayed with him as an adult. The Coolidge White House was home to several canines throughout his administration including Peter Pan, Paul Pry (the half sibling of Warren Harding's famous Airedale, Laddy Boy) Tiny Tim, Calamity Jane, Blackberry, Ruby Ruff, Palo, King, Kole, Bessie, Rob Roy and two white German shepherd dogs named Rob Roy, and Prudence Prim, the last two being personal favorites of the First Couple. Within a year Herbert Hoover occupied the Presidential office and the White House remained a dog friendly place. First Dogs that "served" during his administration included a collie by the name of Glen, Yukon the malamute, Patrick the Irish wolfhound, Eaglehurst Gillette an Irish setter, Weejie the Elkhound, Fox terriers Big Ben and Sonnie, and perhaps the best known, German shepherds Pat and King Tut. It has been suggested that photos of Hoover posing with King Tut made him appear more friendly and approachable and may have helped him win the presidential election. The big nervous shepherd came to be known as "The Dog that Worried himself to Death," due to his vigilant patrol of the White House Lawn as he served his master and family in the period following the Stock Market Crash. With its first official observance, Will Judy's enthusiasm for National Dog Week even managed to cross the Atlantic Ocean, as documented by a headline of the Ottawa Citizen in September 1928 that proclaimed, "Every Dog in England Had His Day This Week in National Campaign." According to this news item, London, celebrated the very first occasion of the week's observance with "8,500,000 dogs wagging their tails in glee," during its closing ceremonies. It was further reported that "Sermons on dogs were preached in many churches. Flag days, dances and other forms of entertainment were organized to raise money for veterinary institutes." 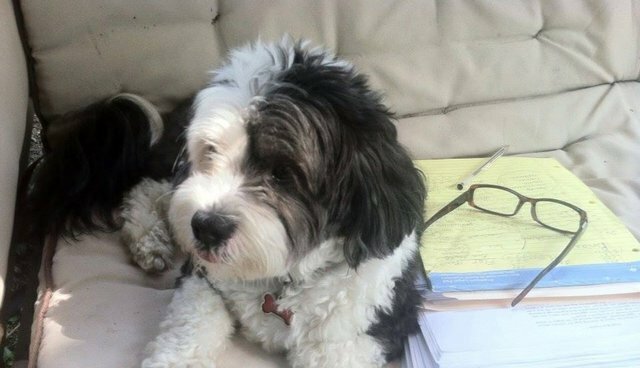 Two years later, a story in Time Magazine reported that a "stylish dog doctor," named Arthur W. Smith had established hospital for dogs suffering nervous conditions in West Orange, New Jersey. Details included how each canine patient would have a private rook and fed a diet of scientifically prepared foods. In the event of their death, they would have the privilege of burial in a cemetery located on the grounds of the infirmary with graves covered with fresh flowers. But with the crash of the Stock Market in October 1929 and the economic devastation that followed, not everyone exhibited this devotion to dogs and National Dog Week was a victim of poor timing. With the nation's jobless rate at approximately twenty-five percent, how could Americans lavish their dog population with seven days of attention when so many people were just struggling to get by each day?